When I published my Pomerol book back at the end of 2012 there remained numerous historic wines that I had to still cross off on my “To Do” list. My palate still awaited these wines to cross its threshold. It’s not easy. Ancient Pomerol is more difficult to find than much of Bordeaux since quantities have always been much smaller than those on the Left Bank. In bygone times, wines were not seen as worthy of long-term cellaring and consequently many were consumed in their infancy. Châteaux kept little library stock; in fact, I cannot think of any that have bins full of mature vintages in their cellar. 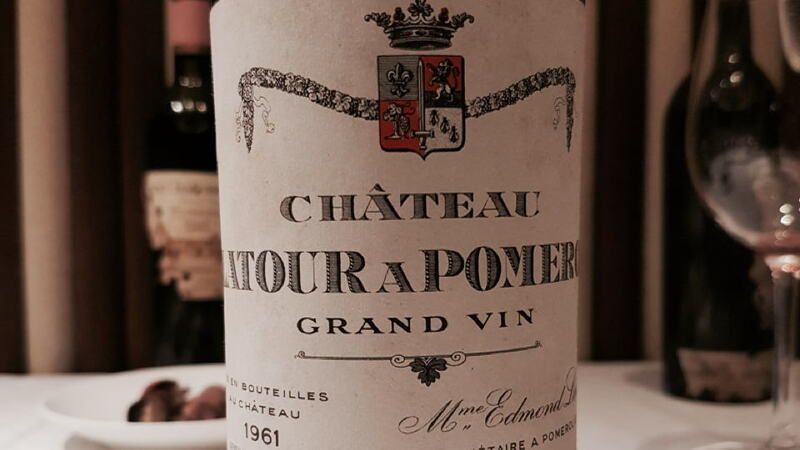 One wine that eluded me for many years was the 1961 Latour-à-Pomerol, this despite undertaking two fairly comprehensive verticals in recent years. The grandiloquent “grande dame” of Pomerol, Mme. Loubat, had presided over her two properties Petrus and Latour-à-Pomerol since the 1920s, referring to Petrus as her “Napoléon”, but Latour-à-Pomerol as her more beloved “Joséphine”. The vines were decimated by the 1956 spring frosts, therefore they must have been infant when they bore fruit that became the 1961. Mme. Loubat passed away in that same year and so who exactly oversaw its picking and vinification is unknown. Jean-Claude Berrouet was still studying and did not make his debut until 1964. My guess is that it was someone appointed by Jean-Pierre Moueix, possibly Emile Peynaud giving some guidance. At long last, I was able to drink a bottle of 1961 Latour-à-Pomerol with a small group of friends in Hong Kong at the famous Fuk Lam Moon Cantonese restaurant in Hong Kong. Provenance is always an issue, especially with respect to wines like this. This bottle was bought through Christie's auction house when they auctioned off Bristol merchant John Avery’s cellar. John was incredibly supportive during the writing of my book, which ended up winning the André Simon “John Avery Award” inaugurated after his passing, therefore there was some poignancy in opening this bottle.